The curtain has risen on the 2018-2019 Santa Cruz Symphony concert season, opening with the first recital of the Spotlight On The Symphony series on September 16. The Spotlight series introduces audiences to the individual talent of Symphony musicians in the intimate setting of the Cabrillo College Samper Recital Hall. Last Sunday’s program celebrated Madeline Jarzembak, the Principal Harp of SCS. During the program, Jarzembak took a moment to demystify this beautiful instrument by speaking about the harp’s unique mechanisms — it involves over 1000 parts including multiple pedals, is extremely hefty, and as it turns out, can spontaneously explode as it ages. 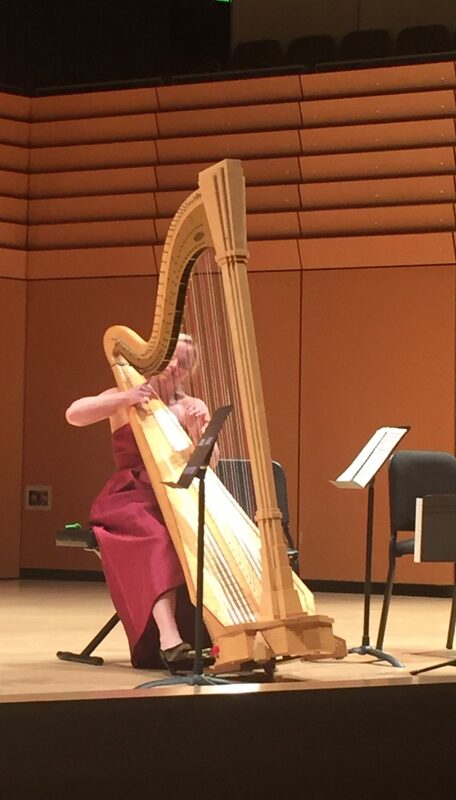 Recognizing the technical challenges of playing this instrument made Jarzembak’s smooth performance all the more impressive; she maneuvered the harp with exceptional grace, composure, and agility. Madeline Jarzembak at the Samper Recital Hall. Just as the harp appears to be an instrument unlike all others, Jarzembak stands out as a soloist who is as versatile as the instrument she plays. She is a graduate of the prestigious Curtis Institute of Music, and has performed harp with numerous orchestras, including the Philadelphia Orchestra and San Francisco Symphony. 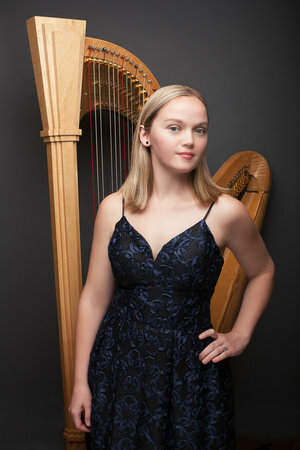 She was an award-winner at the 2009 International Harp Competition “Golden Harp” in Russia, and has won prizes at national and local American Harp Society Competitions. In addition to performing with SCS, she studies at the San Francisco Conservatory of Music with Douglas Rioth, and is the busy mother of three children. Jarzembark’s performance last weekend included a selection of contemporary and classical music by composers Nina Rota, Joseph Haydn, Haim Permont, Bedrich Smetana/Trnecek, and Jacques Ibert. The music took her fingers to the very edges of the harp and back again; ascending with delicate, refined tones and cascading back down in rich, colorful notes that lingered in the air long after she gently stopped the strings. Her blink-of-the-eye pedal changes, ease with traveling the strings in a flash, and elegant stage presence define her as one of the Symphony’s outstanding professional musicians. Jarzembak was also joined by Jonah Kim on Cello, and Rebecca Jackson on Violin, who are both highly esteemed for dynamic performances as soloists, as part of a chamber ensemble, or within an orchestra. The trio was hypnotic in their effect together. Kim’s expression and Jackson’s sensitivity with their strings complimented Jarzembak’s radiant style on harp for a collaboration that was varied in temperament and rhythm, respectful of each other, and altogether harmonious. The audience experienced yet another facet of the artist’s expertise and the harp’s limitless range, when Jarzembak finished with a delightfully upbeat jazz piece during her well-deserved encore. Tickets for the 2018-2019 season are available at santacruzsymphony.org.